For some, the whole point of Central Australia is Uluru. For others the whole point of AUSTRALIA is Uluru. And who can blame them? It’s HUGE. It’s magnificent. It’s RED!! But Central OZ isn’t just about Uluru and Kata Tjuta. Of COURSE they’re several kinds of awesome, but there are lots of other attractions that’ll show you just as good (and far less crowded) a time! And – even better – they’ve all got that trademark Central Australian RED! So you’ve hired the car, seen Uluru and you’ve got another few days to kill. Or if you’re REALLY lucky, you’re an Aussie with a camper trailer and a bit of time on your hands. So what do you do? Hit the road – and see my TOP 7 Central OZ Red HOT Spots! Just click the headings for more info!! Just down the road and round the corner from Uluru, Watarrka, as it is known to the local indigenous people is SO worth the 166 km one way detour off the Lasseter Highway back towards Alice Springs. For many Aussies, visiting Kings Canyon is a tribute pilgrimage to a famous scene from classic OZ movie ‘Priscilla, Queen of the Desert’. Haven’t seen it? Click HERE for a trailer! But you don’t have to hike the Canyon in a frock to show yourself a good time. The 6 km (4 mile) Canyon Rim circuit requires a reasonable level of fitness, but as you cross the rugged rocks you’ll get to see stunning vistas across the plain, the Lost City and Garden of Eden and sensational sunsets that make those towering rocky RED cliffs GLOW. Besides, it’s not a race! Is it? Stay at the Kings Canyon Wilderness Resort campground (closest to the Canyon) or at nearby Kings Creek station so you don’t have to rush. The men in frocks have long gone, but the awesome RED Canyon will be here for a LONG while yet! So you’re back on the Stuart Highway heading north to Alice Springs. An hour or so before you get there, you’ll pass the Stuarts Well Roadhouse. Unless you’re a SMART traveller, in which case you’ll stop. Because Stuarts Well has one of the most bizarre and uniquely Australian Outback travel experiences you’re likely to see. Unless you’ve already spotted a singing, piano playing Dingo named Dinky someplace else, that is. For many years, roadhouse owner Jim ran tours to Kings Canyon from a resort he and his family built from scratch on nearby leasehold land. Until one year, the landowner resisted all attempts to re-negotiate their lease. Strangely unwilling to ‘gift’ the resort they’d paid for and built by themselves on their leasehold to someone who hadn’t done anything towards it but collect the rent, Jim and his family destroyed it. There’s even accommodation and campsites at the roadhouse for those who want a dinner and show experience with a difference! STOP PRESS! In what must be a dark day for Central Australian Tourism, Dinky the Singing, Piano Playing Dingo has retired. Of course, the legend lives on in the hearts and minds of those who have seen him … AND countless YouTube clips! See Dinky in full voice HERE! Just as well there’s a special bonus EXTRA attraction below to make up the numbers, huh?! Staying at Stuarts Well puts you in the hot seat for a 22 km one way dirt road detour off the Stuart Highway to the amazing Rainbow Valley. With a rainbow of multicoloured rocks rising above the (frequently dry) salt lake in front of it, the rocks are easily accessed from a short track from the visitors car park. 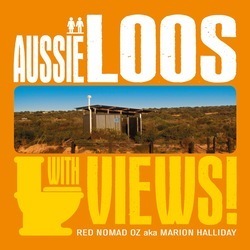 Stay at the Rainbow Valley Campground (is it a coincidence that my best photo of the Valley contains one of the best Scenic Public Toilets in the country?) to be right in the (RED) hot seat for some extraordinary outback sunsets.And if it rains?Well … the road might be impassable, but at least you’ll get to-die-for pics of the amazing Rainbow Valley formations reflected in the lake! And I’ll be as jealous as hell! 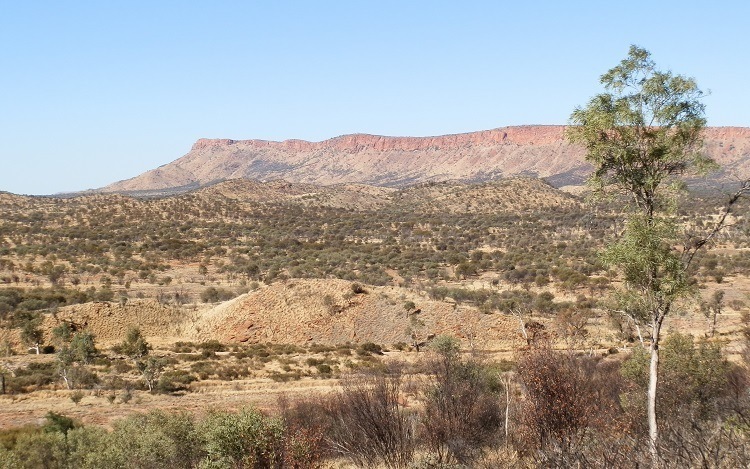 Many years ago when I first toured the West MacDonnell Ranges, I didn’t call in to the Ochre Pits ~115 km from Alice Springs along Namatjira Drive. I won’t be making that mistake again! 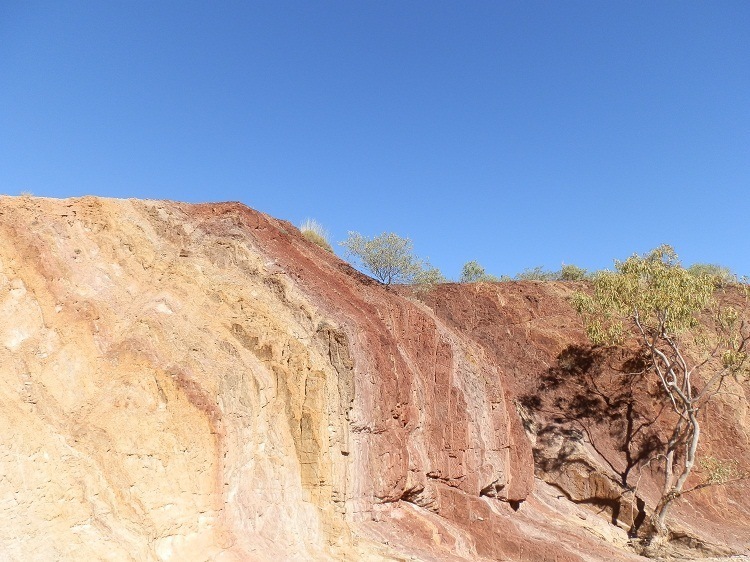 The intriguing contours of (not just RED) colour in the creek bed and surrounding rocks, and its status as a place of significance to local Indigenous people from the area show a different – and fascinating – side to Central Australia. Just up the road from the Ochre Pits, if you can’t find LOTS of cool things to do at Ormiston Gorge, you clearly haven’t read my 7 TOP Ormiston Gorge attractions guide (see link in title)! Yes, it’s going to take more than one day to explore this end of the West MacDonnell Ranges and Ormiston Gorge is the best spot from which to do it! Staying at the nearby Glen Helen Resort with its own spectacular gorge, or the Ormiston Gorge campground means you don’t have to rush back to Alice Springs before you’ve seen – and done – everything. But be warned. Don’t bother with this option unless you’re up for magnificent sunrises and sunsets; the Ormiston Gorge and Pound walk – one of the best short(ish) hikes in OZ; the stupendous splendour of nearby Mt Sonder; the beauty of Glen Helen Gorge and the glorious, glowing RED – everywhere! This is as close as I got to Gosse Bluff. 175 km west of Alice Springs, the long line of gorges, waterholes and mountain ranges that forms the West MacDonnell Ranges comes to an end at Tylers Pass – from here the road snakes down onto the plain. We’d spent the day exploring the area around Ormiston Gorge and driving as far as the Tylers Pass lookout had been an afterthought to end the day before heading back to the campground. About 21 km from the lookout, the vast bulk of Tnorala – the remains of a comet crater, 5 km (~3 miles) across – is an impressive sight. With no camping allowed at the Bluff, the only option was a flying visit. But even if we’d wanted to attempt a kamikaze night drive cutting a swathe through the nocturnal desert creatures feeding at the road’s edge, visitors to Tnorala need a Mereenie Tour Pass. And the nearest place to get one was back at Glen Helen Station. But it’s SO on the list for next time! Yes, I know. EVERYONE’S been to Simpsons Gap, that narrow passage (there’s only so many ways to say ‘Gap’) through the MacDonnell ranges. Only 18 km west of Alice Springs (or 17 km along the bike track) it’s the ‘Claytons’ Central Australia tripette de rigueur from the Alice if you haven’t got much time. BUT the rewards are even greater for those who spend a bit more time and take the 1 hour return Cassia Hill walk up onto the schist escarpment (once part of the floor of a massive inland sea) and look down on the Gap. Wildflowers, classic Central Australian scenery – and a staggering 360ºview, of which Simpsons Gap is a very small part. That’s the thing about Central Australia. Wide open spaces. Magnificent mountain ranges. And an endless supply of RED! Did I say SEVEN cool things? Of course there are WAAAAAAY more than that – so here’s another one for nothing! Even though it’s 335 km and ~3½ hours north of Alice Springs, the great sprawl of spherical sandstone rocks weathered by the wind and sand all aglow in the Outback light are worth the trek. Especially if you’re there at sunset. Or sunrise! 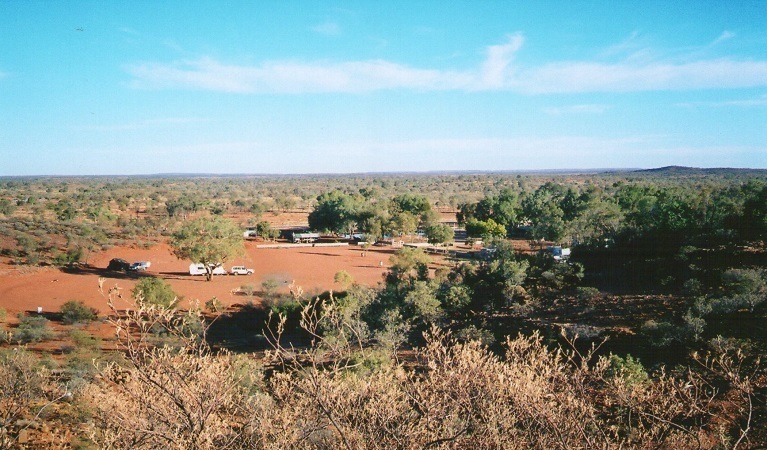 Which generally means staying at the Devils Marbles campground, or at nearby towns Wauchope or Wycliffe Well. Aboriginal Dreamtime legend and scientific explanation both offer theories the spheres’ formation. But in this region with its strong colours, harsh climate and stark beauty, the Indigenous theory seems more appropriate. It’s easy to see why this is a sacred site and also a ceremonial and trade meeting place for four different Aboriginal language groups. 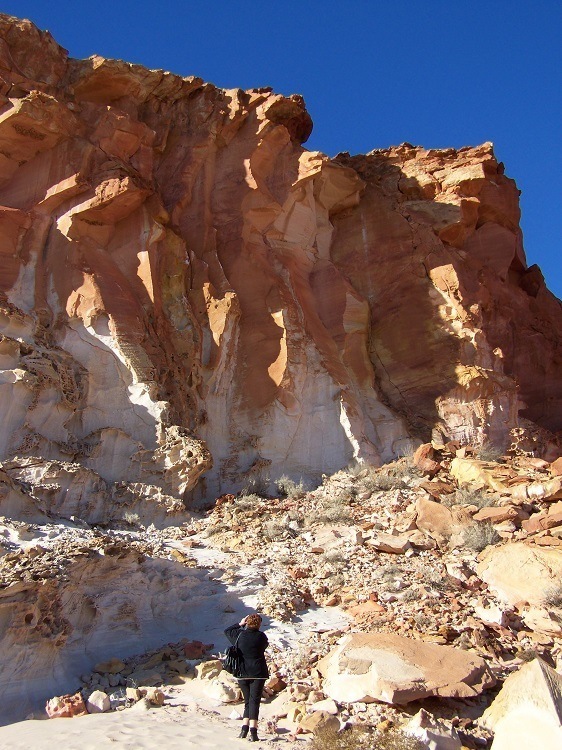 Central Australia has enough other attractions in both colours – RED and not-RED – to keep you busy for weeks. « RED Alert #11 – InspiRED by Pretraveller! I have visited couple of these places before and you have captured the real beauty here. I haven’t really got a chance to go through the dense forest part of Australia , as I am little afraid to give it a try. 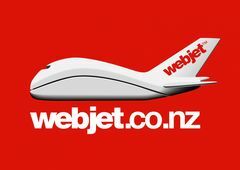 Amazing blog for the travellers. 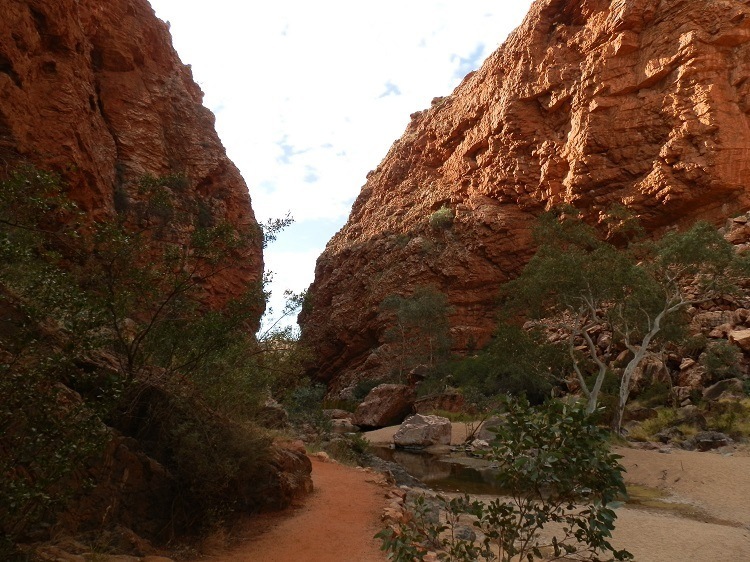 I agree with DianeB – Kings Canyon is a top favourite. In fact, forget Uluru and just head for Kings Canyon. You’ll never walk alone – I love it! Amazing. Reminds me of Grand Canion, Colorado and Utah. One day I’ll have to visit those spots and do a comparison! Our Central Australia is even better to see for real!! It sure is beautiful, but oh so crowded! And, yes, took a pic of Priscilla – sadly on one of our apartment-moves I lost the DVD, gah! We also visited the Northern Territory Beef Jerky Factory in Alice! And got Jerky into Germany (not allowed due to Australia belonging to GB/BSE) this time (don´t tell!). Sweet memories of Kings Canyon, too, thanks for bringing it back! Sadly we had no idea of Jim’s! Missed heaps but Ochre Pits we´ve seen, too 🙂 There was even water at the MacDonnell Ranges! Ups. Guess that was indeed Simpsons Gap! You really get out there in the Outback. I always wonder if there is some massive casino hotel right behind you sometimes. Hahaha!! How did you know?? There IS a massive casino in Alice Springs … but I’ve never been inside! That would be seeing RED in quite a different way!! Lovely Red photos 🙂 We live in a great country in more ways than one. We do indeed! And I’m not just saying that because of all the RED!!! Hahaha! Why don’t you give him a free subscription?? Just put his email address in the box on the top right, tell him you’ve got a gift for him & all he has to do is click the confirmation link in the email!!! It MIGHT work, right??!! Another fabulous post! I can’t get over how much this part of Australia looks like the southwestern part of the United States. We’ve got very similar canyons, red rocks and outcroppings all around this area. But, what we don’t have is a piano playing, singing dingo. That I have to say is truly a one of a kind. P.S. I loved Priscilla, Queen of the Desert! I’ve heard that before … and not just from you!! Maybe we should do a joint comparison tour one day??!! The Dingo is one of the most bizarre experiences I’ve had downunder – and I was lucky to see it!! What magnificent scenery you have shown us here. My mother used to have a singing dog – it was particularly fond of “You’ll never walk alone” and used to howl (roughly in tune) all the way through! Hahaha, that’s hilarious!! But it sounds like he could sing better than some people??!! Dinky the Dingo was far less discriminating … the pianist didn’t need to be playing an actual tune, any mish-mash of discordant notes would set him off just as well as a song! I was so excited when I read your post because for once I have actually done one of the things on your list. I visited King’s Canyon and walked round the rim. A highlight of my trip to Aus I might say. Fantastic! Now we really DO have a shared experience in common! But you have been there more recently than I have – I wonder did it look any different when you did it?? The heartland of Australia certainly knows how to give a grand display of rocky colour. Combine that with wonderful skies and you have yourself a paradise. I for one would love exploring the detail of those rocks from a macro perspective. I wasn’t so much into macro when I last visited – my camera was still pretty new! I’d love to go there again & see how different my photos turn out! That’s what comes of a low boredom thresh-hold!! Red, thanks for sharing your top places of Central Australia! I love the photos and there are so many great places to visit. It’s my pleasure! Much as I love Uluru and Kata Tjuta, there are so many other awesome spots that don’t get as much publicity! I hope this doesn’t mean they’re ‘full’ next time I go there!! I love the Devil’s Marbles sun rise and sunset photos, they’re so vivid. Thanks for the great tour of the highlights. Looks like one could spend weeks enjoying the scenery. One could … and this one has!! And I still haven’t seen everything!! That cockatoo looks like he’s having a grand time, just hanging out. Those Devil’s Marbles make a very vivid photography subject. You must have had fun with your camera on those! We were lucky to see the cocky – they’re not all that common and mostly found out in the more remote areas. As for the Devil’s Marbles shots, all I had to do was hold up the camera and click! It’s almost TOO easy to take good shots there!! Dit is iets ,ik heb er geen woorden voor, wat is dit geweldig mooi. Dank je, mijn vriend. Centraal-Australië is als geen andere plek op aarde – en het is nog beter om zelf te zien! Ik hoop dat je het een dag te maken! Australia does have gorgeous scenic views. How cool to see a singing Dingo. And I love the Cockatoo, they are pretty. Thanks for sharing your visit, enjoy your week ahead. The cocky is one of my favourite Australian birds … but they’re not that common, so it’s always a thrill! Of course, the singing Dingo is even LESS common!! Have a great week, my friend! 🙂 you’ve seen that dingo singing for yourself and I’ve only seen it on tv – I wonder if the piano actually disturbs him?! Fabulous tour spots; great photos and for some reason I wonder do you make it up in time for EVERY sunrise?? It was one of the most bizarre things I’ve seen … right up there with racing Cane Toads!! And no, I SO don’t make it up for every sunrise 🙂 Just the late ones!!! Hey, happy to oblige you with an Outback fix anytime you need one!! You don’t HAVE to travel to the outback to see the ‘real Australia’ (whatever that is), but it’s an awesome experience! 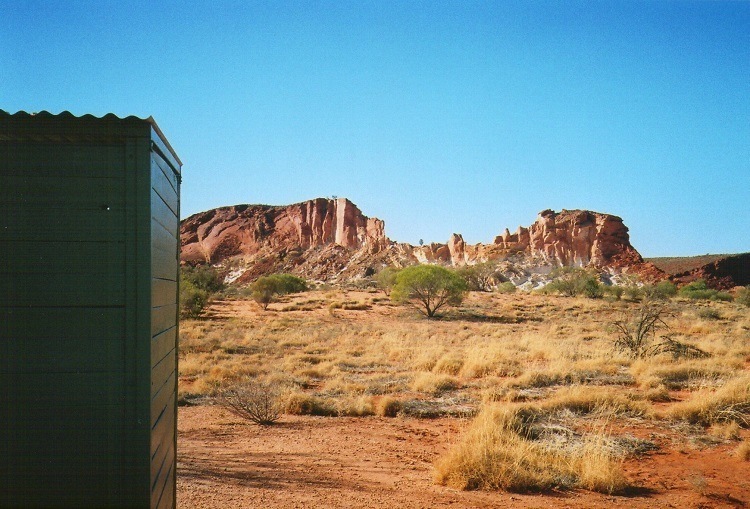 Maybe I’ll do a post on the accessible Outback – just for YOU! Another great travel post. So much to see out there. We weren’t there long enough but my favourite place other than the rock and Kata Tjuta was King’s Canyon. We were lucky enough to stay at the resort with a picture window over the spa bath so I could sit among the bubbles and look out to the red desert scenery. Because one of us is not able to do big walks or climbs we did the canyon floor walk and that was pretty spectacular too. Lovely shots and a great Loo with a view. Wow, that bath sounds awesome!! We also did the Canyon Floor Walk – it’s amazing to be in the gorge surrounded by all that RED! The RED Centre is full of great things to do – it’s a shame so many tours only focus on one or two of them. Have a great week! I DO have a video of the Dingo taken by Pilchard … trouble is, there’s a young woman from the audience who I don’t know playing the piano & I’ve always been in two minds as to whether that would be a breach of privacy. Pity … our video is REALLY GOOD! Our experience was in 2008, so maybe she’s unrecognisable now?? What do you think?!? !